A major safety improvement to a South Los Angeles County railroad crossing at the intersection of Rosecrans and Marquardt Avenues was announced today by the Los Angeles County Metropolitan Transportation Authority (Metro), U.S. Representative Linda Sanchez (D-Whittier), Caltrans, the California High Speed Rail Authority (HSR), BNSF Railway and the city of Santa Fe Springs. 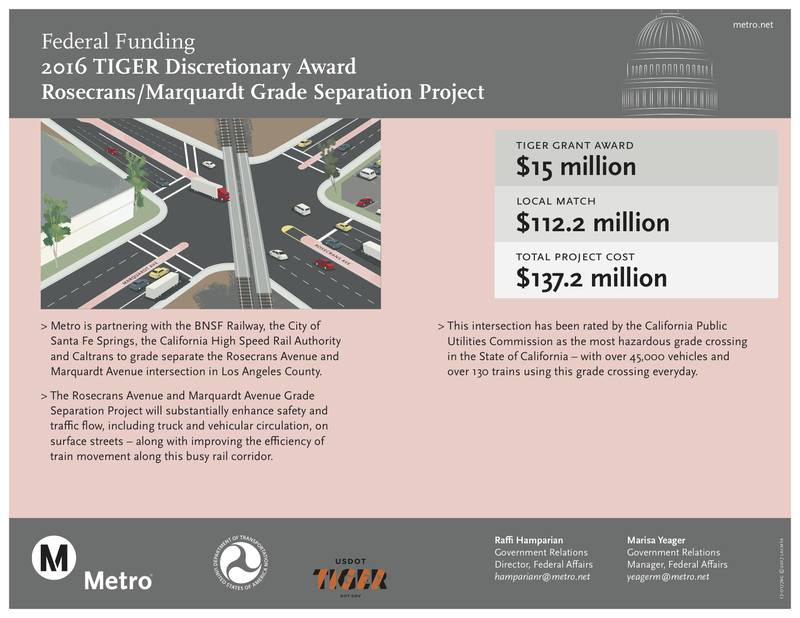 Rep. Sanchez unveiled a $15-million Transportation Investment Generating Economic Recovery (TIGER) grant contribution to the $137.2 million cost of building a vehicle overpass on Rosecrans Avenue. In addition to the federal contribution, funds from state Proposition 1A, Section 190, L.A. County’s Measure R, and BNSF will pay for the safety improvement. The California Public Utilities Commission (CPUC) rated the intersection as the “most hazardous” railroad crossing in the state due to past collision history, the volume and speed of vehicular traffic and frequency of trains that use the tracks. From 2013 to 2015, the CPUC recorded 22 incidents involving vehicles and trains resulting in 4 fatalities and 6 injuries. An estimated 45,000 vehicles and 130 trains daily use the intersection of Rosecrans and Marquardt. Trains cross about every 10 minutes bringing vehicle traffic to a standstill for a total of 21 hours per week. Construction is scheduled to begin in January 2019 with completion expected in January 2021. Photos of speakers at the press event and the rail crossing are available for download here. Press coverage: Whittier Daily News and L.A. Times. I wonder why the crossing gates could not prevent these accidents. Some people don’t read the memo. Santa Fe Springs is actually in southeast Los Angeles County.